I haven't checked in for a while, but I've gotten quite a few messages and comments asking how things are going with my knees. It has now been exactly 5 years since I had the injury that necessitated the MPFL surgery, and it has been about 4 1/2 years since MPFL surgery. Some of you may remember that I also had an additional surgery in 2011 to clean out scar tissue that was causing my knee cap to "catch" when I walked. Reflecting 5 years later, I am pleased in the way that the MPFL surgery turned out. However, I will say that the IT band problems remain, and the pain in my outer knee area can get intense. I also feel a grating feeling when I bend and straighten my leg, but I'm not sure this has anything to do with the MPFL surgery or IT band. I continue with foam rolling, but it is an arduous task. What I've learned about foam rolling and IT bands is that you have to keep at it. I've made the mistake of thinking that since the pain has subsided, the problem must be fixed, and I stop with the foam roller. (Let's face it--that thing feels like a medieval torture implement!) But, the thing is--you can't stop. The problem is ongoing and requires diligence to remain pain-free (or, more likely, just to minimize the pain). I never have days where my knee doesn't hurt a little, but honestly, to me, it's a small price to pay for knee stability. And the scars---hardly even visible! You really have to look closely to see them. Now...I also had bunion surgery a year and a half ago on my left foot, and I'm going to have it soon on my right foot. When I told people I was going to do this, many people told me it would be a mistake. I would regret it. People said that it was the most painful surgery they had ever experienced. Once again, I have learned that I either have an amazing tolerance for pain, or I have an amazing podiatrist, because it honestly did not hurt at all. I only took the pain meds for two days, and after that, I really didn't use any pain meds at all (not even Tylenol). And, I still feel that like with the MPFL surgery, the temporary pain is well worth it when the daily persistent pain is gone. Bunions hurt! But, my left foot now feels amazing--so great that I'm eager to have my right foot fixed. Dr. Kahen at Southern California Kaiser Permanente is my podiatrist, and I couldn't be happier with his care. I'm going to keep posting more blogs during the upcoming weeks while I have time off from work (Winter Break!!) See you soon! I visited my knee surgeon and one of my friends who is a sports therapist. Both suggested that the pain I'm experiencing may be due to tightness of the IT band. Both recommended a foam roller and some stretching exercises. I will post a helpful video from Spark People about how to use a foam roller to release your IT band. It has helped a lot, but be forewarned...it can be painful depending on how much pressure you use. However, I've found that enduring the pain during rolling helps a lot with the stiffness and pain afterwards. My knee hurts much less when I wake up in the morning if I roll before I go to bed. My friend also suggested a sports massage. Luckily, I live in L.A. where there are many sports massage places. The place she recommended is called L.A. Sports Massage, and I saw a guy named Jason. He was AWESOME. He basically did the same thing that I do with the foam roller, but he used his hands to apply pressure. He gave me tips for stretching and releasing the IT band, and this has been a life saver! He told me (as did the doctor and my friend) that maintaining flexibility in the IT band is an ongoing thing. It's not something that will "heal" and go away. It's not an injury...it's just tightness, and like any tight muscle or tendon, you need to work at stretching it...forever. Okay, that part is annoying, but a small price to pay for pain relief. So, I highly recommend you look into this if you're having pain at the hip or knee joint, especially after prolonged periods of bent knees. The IT band runs from the hip to the top of the knee on the outside of the leg, so the pain may present itself anywhere along that band. Give these things a try if you're struggling, but as always, consult your doctor first!! These are just a few things that have helped me. I still get many comments about my MPFL reconstruction, and I'm so glad that many people have found it helpful. I get so many comments, that it is difficult for me to respond to all of them, but I did want to give a quick update to many of the questions that I get asked. Q: What exactly did you have done? A: I had MPFL reconstruction and a scope to clean up damaged cartilage in June 2010 after a patellar dislocation/MPFL tear in December 2009. Q: How many surgeries have you had on your knees? A: I have had four total: two on my left knee and two on my right. When I was 15, I had both knees scoped with a lateral release. This surgery was unsuccessful in stopping my patellar dislocations. At 17, I had a left knee realignment. From what I remember, ligaments were transposed and are held together at the base of my knee with a screw. This has successfully stopped dislocations, but according to doctors, my knee still appears unstable. I've had MPFL reconstruction/scope on my right knee at the age of 37. A piece of my hamstring was grafted on the inner side of my right knee, and the scope cleaned out damaged cartilage. Although suffering a partial dislocation, my knee is stable and generally in good shape. Q: How long were you off from work with your MPFL surgery? A: This is complicated! I work in a school, so I actually scheduled the surgery during summer vacation. Therefore, I wasn't really taking time off from work. I had about 2 1/2 months off from school to recover, but I truly believe that I could've gone back to work the week after the surgery. I wouldn't have been as mobile as I would have liked, but I was up walking around, doing some housework, taking walks...the day after surgery. I had very little pain. At the most, I would have taken two weeks off from work if I had the surgery done during the school year. Q: Did it hurt? What kinds of pain meds did you take? A: In all honesty, it wasn't that painful. For the first two days, I took percocet regularly to stave off pain, but those gave me a headache that hurt worse than my knee, so I stopped those after two days. I did have a nerve block which helped, but it left part of my leg numb for about six months. Not painful--just annoying. And, I have full feeling back now. I was also given vicodin, but I never needed it. I occasionally took ibuprofen before physical therapy. Q: How much therapy did you do? A: I went to 24 physical therapy sessions--3 x a week for 8 weeks. I also worked out extensively at home--stretching every chance I could get. Q: How long before you got full range of motion? A: I could go around fully on a bike at 4 weeks, and I also could bend my knee fully at 4 weeks. This is only because I did the stretches and strengthening exercises religiously at home and at therapy. A: Yes. I received a cortisone injection last week in my right knee due to pain. The doctor believes it is inflamed scar tissue. The injection worked (yay! ), but I have no idea how long the effects will last. I may have to have another scope to find out if scar tissue is blocking my patellar tracking, because my knee is locking in place. 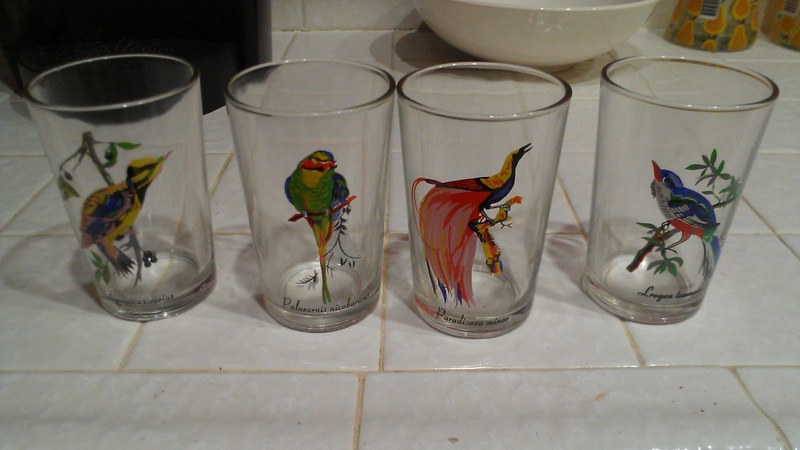 More Thrift Store Finds--It's About Time!! I found these cool vintage juice glasses at the House of Yaweh thrift store in Redondo Beach. Bought all four for $2.00. Circa 1950s. This is a vintage (circa 60s?) 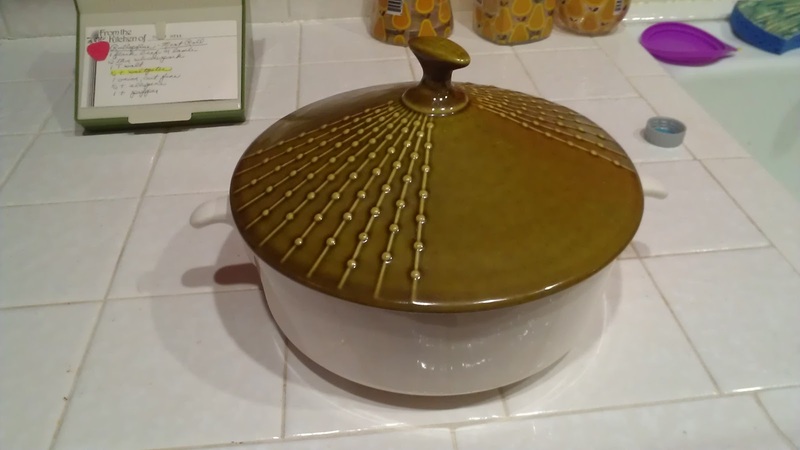 olive green covered casserole dish. I found this one at the Goodwill in Cedar Falls, Iowa, University Ave., for $1.99. Love it! Someone is selling a similar one on etsy for $40. 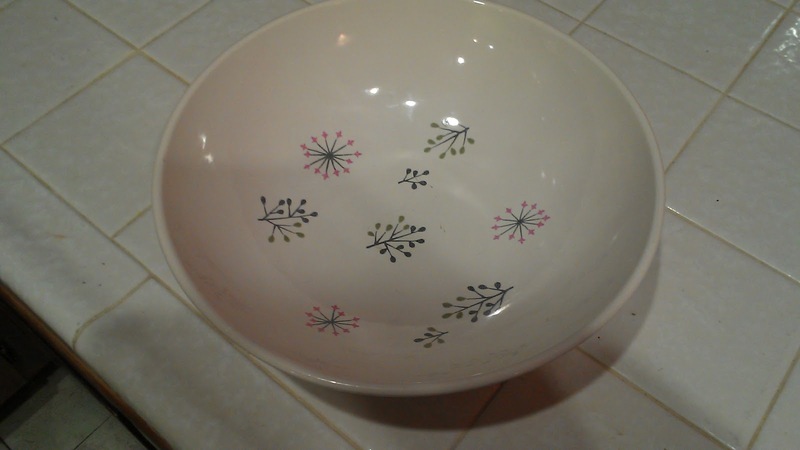 This is a Franciscan Echo pattern large serving bowl. I found this at my favorite thrift store--Redondo Beach Salvation Army. It was $4.99, and it is from the 1950s. It is selling for about $40 online. I honestly can't remember where or when I got this one. It's a cool mid-century modern candle holder from Germany. I just liked the colors and patterns. Reminds me of a totem pole. How could I pass these up? 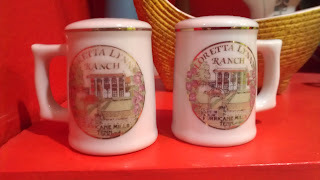 These are Loretta Lynn ranch salt and pepper shakers I found at the Angel View Thrift Store in Palm Springs, CA. I love them. That's why I think I'm a very special person--because I can appreciate these like nobody's business. Ha ha! 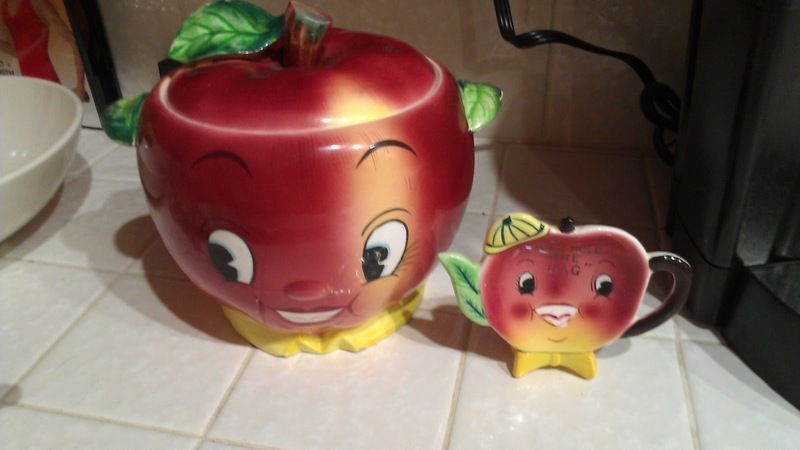 They were $1.99 for the pair. 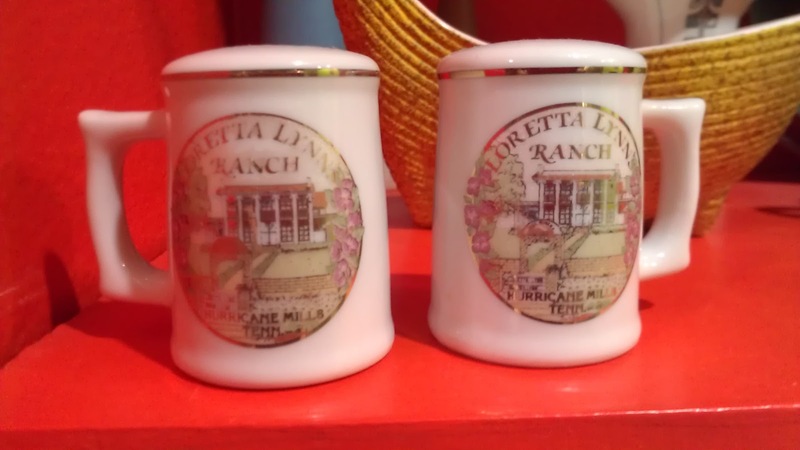 This mug made me squeal with joy! Mary Tyler Moore mug with the MTM logo and that cute little orange cat that meowed at the end of the show's credits. 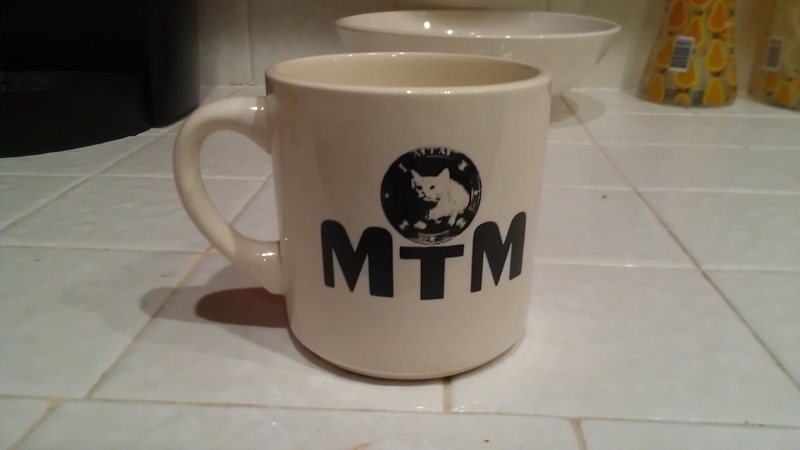 I definitely remember this from my 1970s childhood, yet I can't find mention of this mug's existence anywhere on ebay. It was $1.99. Kind of expensive, but so worth it! 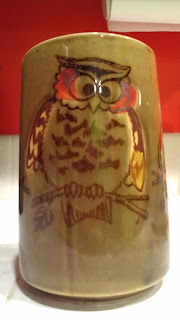 A 1970s Otagiri owl mug. Same RB Salvation Army. $1.99--valued online at around $12. Not a huge find, but cheaper and cooler than the brand new owl mug I almost bought at TJ Maxx! 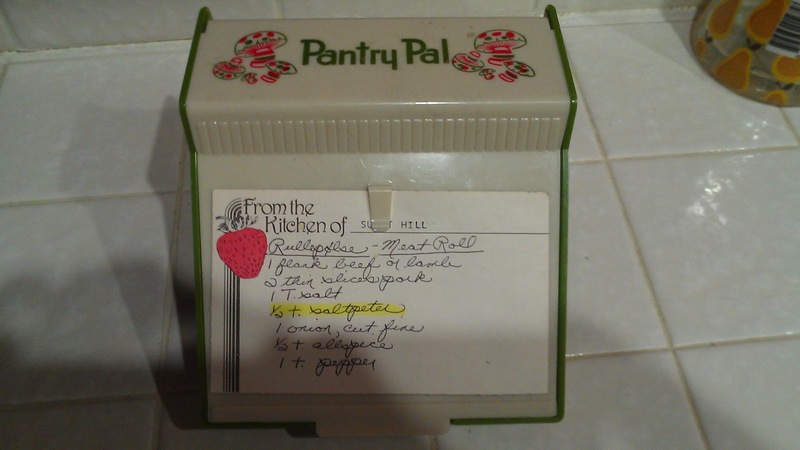 A vintage recipe box called the "Pantry Pal." I got this in Mt. Vernon, Iowa, at an antique store, so I paid a little more--I think about $10.00. 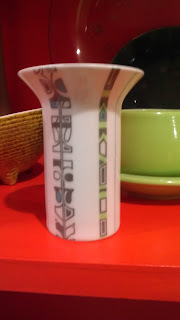 I think it's from late 60s or early 70s--the colors and mushrooms lead me to that. I've put my grandmother's recipe card for the Danish meat Rullpolse on here...note the highlighted ingredient: saltpeter. Where the heck does one get that?! 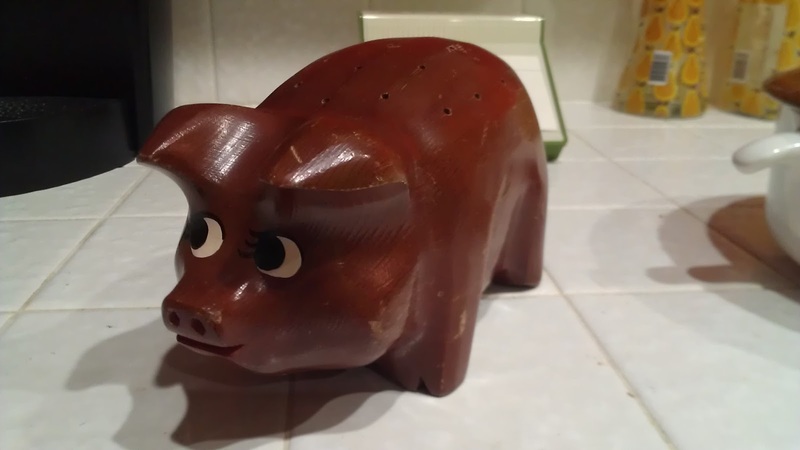 This adorable wooden pig is an hors d'oeuvres server. It has little holes for toothpicks that hold tasty treats. 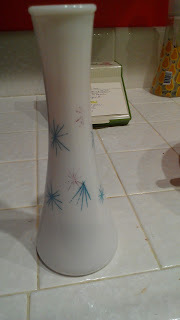 It has a sticker on the bottom that reads Pasadena. I got it a a thrift store (can't remember which one) in Cathedral City near Palm Springs. It was $1.99. I've seen similar ones online for about $20. I also have a pineapple like this--wooden with holes for toothpicks. That means I have a collection, yet I hardly ever serve hors d'oeuvres. Still, I think she's cute, even though the red lipstick on her "lips" is kind of creepy. 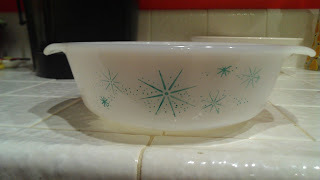 A cute starburst casserole dish from Goodwill in Cedar Falls, Iowa. $1.99. 1. I slipped and fell on a puddle of rainwater, resulting in a dislocated patella and torn MPFL. 2. I spent 6 weeks in a brace, and it took about 12 weeks to fully recover. 3. Since the injury occurred at work, I had to make many phone calls and doctor visits before I was able to see the right doctor--a mere one-hour drive away. He is the only surgeon in the Southern California Kaiser Permanente network who does the surgery. 4. I have the surgery in June (my injury occurred in December). 5. I spend three months in intensive physical therapy. I started the day of the surgery--bending and stretching. Yes, it hurt, but this is what my doctor recommended, so I did it--religiously. 6. It took about 1 1/2 years to feel "normal" after surgery. Results after surgery: I do feel that my knee is more stable, but I continue to have pain. The doctor said it could be cartilage damage or inflamed scar tissue. I have not gone back to have him confirm either, but I could at any time. It hurts most at night when I'm trying to sleep. I did have one minor injury of that knee, where I suffered a partial dislocation. It was fairly minor, as I was able to stop things before the patella completely dislocated. I do think that the surgery helped keep the patella in place, too. Is my knee perfect? No, but I never expected that because I have horrible knees. But, the surgery seems successful, overall, and the doctor (Dr. Csintalan) was great. I'm an Iowan by chance and I'm a Californian by choice. I'm a midwestern expat living in Los Angeles. I love nerds, dorks, geeks, and spazzes. My heroes are Gandhi, Martin Luther King, Jr., the Dalai Lama, Nelson Mandela, and Charles Nelson Reilly. I also love material scientists. And boxers. I'm looking for a material scientist who is a boxer. I don't like it when people start sentences with either "Look--" or "Listen--." 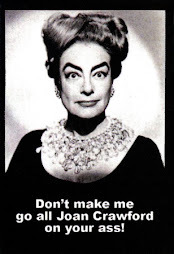 I often dream of becoming Joan Crawford when I grow up. I can't get enough of Diet Coke. He's always there for me. The Parenthood Decision by Beverly Engel M.F.C.C.